The figurative term ” Having information at your finger tips” has now become a reality. The advent of touch screen cell phones, tablets and easy to navigate menus makes it easy for both the young and the old to walk up to any screen and, without any instructions whatsoever, have vast amounts of information available at their fingertips. As an experienced integrator of kiosks and digital signage technology in Toronto and New York, we know how to present complex and overwhelming amounts of information in a very clear and simple manner. Our content team looks at each kiosk project from the lens of the audience, formulating a scripted representation for the user so that they can navigate seamlessly through multiple options. Decreases retail transaction costs to approximately 75% less than cashier transactions. Gains efficiency through diverse applications. Reduces business and training costs. 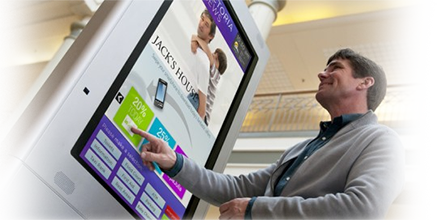 A company can use kiosks to train employees or teach them about the company’s products and corporate procedures. Kiosks’ touch applications are easier to use than traditional computer-based training and teaching. 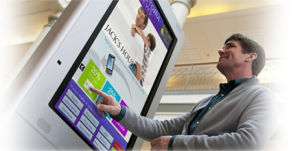 When it comes to kiosk hardware, there’s no such thing as one-size-fits-all. There are countless options available in the marketplace today. Once you tell us what you have in mind, we can then start processing the best available fit for your audience and environment.